Dave and I met in college and became fast friends. Despite a few distinctive differences, we’re quite similar…which is why we sometimes have gotten in fights. Not fist fights, mind you (though I’m secretly waiting for one, just to see what happens); but metaphorical knock-down, drag-out fights of reason. Naturally – I was excited when he agreed to accept the wedding present I offered him: a trip for the two of us to Puerto Rico. One last bachelor hurrah before he wed, grew a beard, and started spending his free time making babies and joining the local PTA. Either this trip would be a great bonding experience full of rest and relaxation – or someone was walking away with an allegorical (or literal) bloody nose. I saw no reason why it couldn’t be both. We hopped on a Spirit Air jet and rattled our way down to the Caribbean for a springtime weekend jaunt. Arriving on the red-eye, we snagged 40 winks or so underneath the most out-of-the-way airport chairs we could find – waking up in just enough time to snag a rental car and watch the sun rise on the beach. Not a bad start. 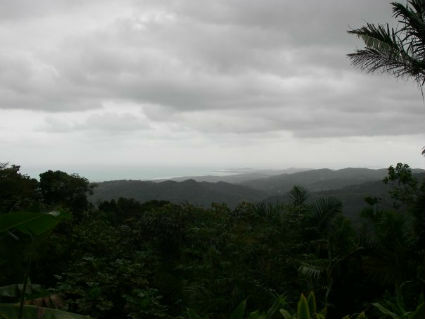 Our destination for the first day: El Yunque National Park. It’s known for it’s lush rain forest, beautiful waterfalls, and the amazing animals that inhabit the U.S.’s southern-most park. We were ready to explore. And then it started raining (which is ironic, because though we were in a rain forest – we weren’t expecting it). Nevertheless, we tightened our belts, donned our rainwear, and made for the woods. It was incredible. The flora, verdant. The fauna, unique and beautiful. These enmeshed with the waterfalls, and lookout views of the coast. We were mesmerized and we decided to camp in the forest for the night, despite the torrential downpour that had been increasing in intensity since we showed up. We found the flattest, out-of-the-way location and – using physics and a couple lessons learned from watching Bear Grylls on Man vs. Wild – set up our tent with expert precision. We got inside and were unequivocally dry. Our travel exhaustion quickly overtook us and we feel asleep at the ripe time of 7:45, the music from the rain and the chirping of the Puerto Rican Coqui frogs merged into a delightful song that serenaded us calmly to sleep. As the sun rose, so did we – and with the realization that we’d scarcely had better rest in our adult lives. We next stepped onto Seven Seas Beach and drew one long breath that seemed to last until we left the following day. While there; we dined on fresh fish (we didn't catch them, but it still tasted great), smooth green lawns, breeze-bent palm trees, and tides quietly calling us to come play…which we – of course – obliged. It would have been bittersweet to leave had we not been so rested that we were ready for our next adventure. We reached Hiram-Bithorn Stadium just in time; teams lining up in the noon-day heat, fans streaming in from various countries. We took our seats in the outfield to enjoy a game of the World Baseball Classic (kinda like the World Cup of Soccer…only much less pomp, notoriety, or overall excitement) which was a fun way to celebrate an international sport that we had both grown up playing. I made him pay for the ticket. No arguments yet (not even the hint of one). 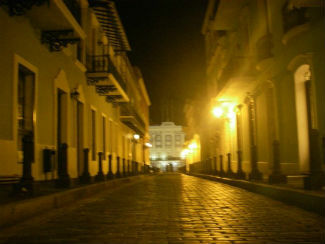 Afterwards, we decided to investigate Old San Juan since this was going to be our last night. We played around in the old fort – El Castillo de San Cristobal – before heading to traditional tourist destination – El Paseo de Princesa, a tree lined promenade overlooking the bay. 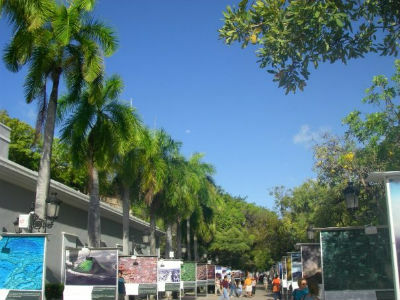 There was a festival being held with vendors lining the streets, and sidewalks ordained with gorgeous over-sized photographs from nature photographers from around the world. 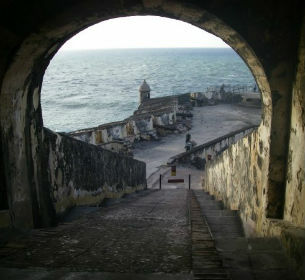 We took in the sceneries, grabbed a pair of local sandals and made our way to Castillo San Felipe del Morro. San Juan Bay was one of the most important ports in the Caribbean for Eurpean settlers. It was bottle-necked by a broad expanse of land that all ships must pass through to portage. 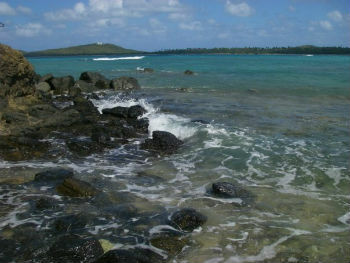 On one side were rocks and shallows which held a few small islands that housed cannons, and the other side housed a large fort (del Morro) that juts out boldly on the eastern shoreline. It is one of the most unique, and enigmatic places I’ve ever been. What used to encase soldiers ready for battle now houses acres of rolling green lawns of city park before the old bulwarks melt into the vanishing horizon. Families picnicking, flying kites, couples on dates, all in this backdrop. It was truly beautiful. And sitting at the precipice of the bay, with the sun-setting – I dreamed of all the ships that, for centuries, had passed those gates into that bay. I was taken aback at the history and natural beauty of the place as the sun caused everything to glow. Walking away, I quickly understood that that location – on that wall, over-looking that bay – had already become one of my most beloved places in the world. I was quite pensive when I realized that it was getting dark and we were explicitly told not to stay after nightfall there – very dangerous for tourists. Though I could more-or-less pass for Latin American, David is pale and red-headed. So, we got the heck outta there. We capped the evening – and the trip – with a nice, casual dinner at a local delicatessen – consuming the last of the rich island fare we could manage – and then made our way back to the airport. It wasn’t until the plane-ride that I realized we hadn’t argued on any point since leaving home. Excited about that, I thought about bringing it up to him, but we were seated next to the disconcertingly loud engine, and there was no use yelling…I didn’t want to test my luck. Later, Dave did finally marry his fiance (who is a gem, by the way). He’s since relocated states, is working another job, and is often quite busy. 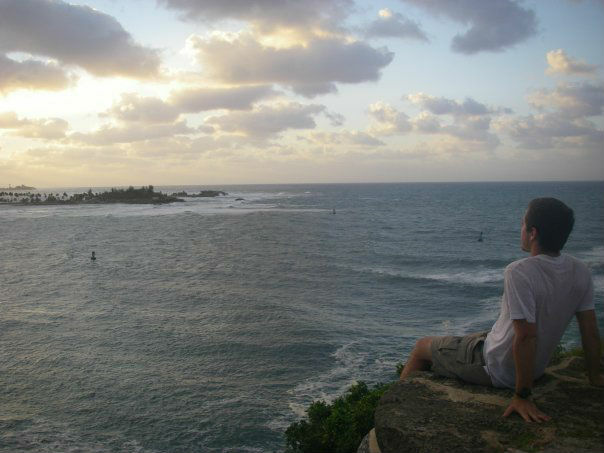 But with a little effort, if reminded of the great time we had a few years ago in Puerto Rico, and how much more is to be had – maybe he could be convinced to skip a PTA meeting or two, so we can go on another adventure together. I’d fight for that.